If you are concerned about your and your family’s health then investment in a good water purifier is the best you can do to ensure your and your family good health. But so many water purifiers are available in the market having different water purification Technologies, that’s why an average consumer gets confused. Probably you are one of them that’s why you stumble here. If you read this Ultimate Water Purifier Buying Guide till the end, then you will be 100% sure about what kind of water purifier you need. I am going to share some important points which you should consider before buying a water purifier. 2 Where to check water for microbial contaminants? 3 Which water purifier is for me if I have high TDS water? 4 Which water purifier is for me if I have bacteria, virus or other microbial contaminants in my water? 5 What should I do if I have dirty water? 6 Which water purifier is for me if I have muddy water and microbial contaminants such as bacteria, viruses and protozoa in my water? Before deciding what kind of a water purifier you need you must test the water you are drinking now. There are several tests you should perform before buying water purifier. The first test is simply drinking and smelling the water. If the water tastes bad then it is impure. Also if it smells bad then it is considered as unhealthy. To perform 2nd simple test, simply take water in a glass, if you found water dirty or muddy then it is impure. Ok if your water does not smells bad or tastes bad or it is not dirty or muddy then it does not mean that it is completely pure. Now you should check the TDS of the water. You can check the TDS by simply using a TDS metre which you can find at very cheap price. Check price of TDS meter at Amazon HERE. TDS (total dissolved solids) upto 500 mg/l is acceptable according to Bureau of Indian Standards (BIS). If the water have TDS more than 500 mg/l then it is considered as unhealthy. If the TDS of the water is lower than 500 mg/l then also it is not considered as 100% pure. To become 100% sure about you are drinking a safe water,you should check the water for bacteria, viruses or any kind of other microbial contaminant. Cryptosporidium, Cyclosporiasis, Diarrheal Disease, Dysentery, Gastroenteritis, Giardiasis, Guinea Worm, Hepatitis E and Typhoid Fever. You cannot perform such test at home you have to test your water at the laboratory. After testing the water at the near laboratory for any microbial contaminants if the water does not contain any kind of microbial contaminants then you don’t have to spend money on water purifier. Where to check water for microbial contaminants? If you live in city then you can easily find laboratory for testing water. If you live in rural area then I have found a very helpful list of laboratories on government site which will help you to find laboratory near you. If you don’t have time to take water to laboratory for testing then you can book it online at purityportal.com they will collect the water sample from your home and will send you the results after testing. So now you have tested your water, it’s time to find ideal water purifier for you. Which water purifier is for me if I have high TDS water? If you have high TDS water then you should go for RO water purifier. RO water purifier has a semipermeable RO membrane of 0.0001 microns which removed dissolved salt and solids from the water. Which water purifier is for me if I have bacteria, virus or other microbial contaminants in my water? If your water contains bacteria or viruses or any kind of microbial contaminant then you should go for UV water purifier. UV water purifier has UV bulb. The UV bulb inactivates the microbial contaminants such as bacteria, viruses and protozoa in the water and stops its functioning and reproduction. Thus protecting you from such microbial contaminants. What should I do if I have dirty water? If you have dirty, muddy water then you should go for UF water purifier. UF water purifiers have UF membrane which removes visible impurities from the water. Which water purifier is for me if I have muddy water and microbial contaminants such as bacteria, viruses and protozoa in my water? You should go for a water purifier having UF and UV water purification Technologies combined. The UF water purification Technology will remove visible contaminants from the water like sand, dirt, mud and the UV water purification will inactivate harmful bacteria, viruses and protozoa in the water and will stop its reproduction, ensuring you are drinking safe water. Majority of the population in India lives in rural area. Usually well water is the main source for drinking water in the rural area or if there is river around then it is also the source for drinking water. Well water usually have high TDS, so for the purification of such water, RO water purification is the only water purification Technology. Also the well water and river water usually gets contaminated by various microbial contaminants through human activities like washing clothes near the water source. Also well water and river water gets muddy during rainy season so RO + UV + UF water purifier is the best solution in such scenario. As RO water purification will remove dissolved Salts and solids from the water and also it will remove heavy metals like Arsenic, Lead from the water. UV purification will inactivates bacteria viruses and protozoa from the water. And UF water purification will help in rainy season by removing visual impurities from the water like dirt, mud and sand. There are two major drinking water sources in urban areas which is municipal water and borewell water. Municipal water is usually treated with chlorine for the purification. When the water is treated with chlorine for the purification then it forms harmful chlorine by-products in it. Also some tresses of chlorine remained in it. During the transportation of municipal water to your house, the transporting pipelines may be rusty or leaked somewhere. At such scenario microbial contaminants like bacteria, viruses and protozoa may get entered in the water. Also when the the municipal water is stored in water storage tank above the building, there are chances that it may get infected by microbial contaminants like bacteria, viruses and protozoa. Also you may be having dirty or muddy Municipal water at your house or it main get dirty during rainy season. At such scenario you should go for UV + UF water purifier. UV water purification will protect you from microbial contaminants like bacteria, viruses and protozoa by deactivating them and UF water purification will remove visual impurities from the water ensuring that you are drinking safe water. If you are having borewell water then it is usually high TDS water, so for the purification of such water RO water purifiers are required. Borewell water may contain harmful bacteria and viruses so to get rid of such contaminants UV water purification is required. Also borewell water sometimes gets muddy especially during rainy season, so for the purification of such water UF purification is required. Overall RO+UV+UF water purifier is the complete purification solution for borewell water. People living in the coastal area usually have high TDS water so they should go for a RO water purifier. Also water can get easily contaminated due to harmful microbial contaminants like bacteria and viruses so it is always a good idea to have a UV water purification for purification of drinking water. If you are having a dirty or muddy water then you should have UF water purification as well. So overall RO + UV + UF water purifier is the complete water purification solution in such scenario. Remember RO water purifier will produce lot of wastewater so you should be ready to use such wastewater as water crisis is one of the major problem in our country. You can use waste water produced from RO water purifier for plants, mopping and cleaning cars. Some water purifier also comes with TDS controller. TDS controller as the name suggests it will help you to control the TDS of water so if you have low TDS then you should consider this feature in a water purifier as well. You may have noticed that every water purification Technology have its own benefit. RO water purifiers can remove dissolved solids and Salt from the water. It also removes heavy metals like Arsenic and Lead which no other water purification technology can remove. And it cannot remove microbial contaminants like bacteria, viruses and protozoa from the water. UV water purifier can inactivate harmful microbial containment and such as bacteria, viruses and protozoa from the water but it cannot remove dissolved solids from the water. Also it cannot remove visual impurities from the water. Whereas UF water purifier can remove visible impurities like Sand, Dust and mud from the water but it cannot remove dissolved Salts and solids from the water as well as bacteria and viruses from the water. Before buying water purifier, you must perform all the tests listed above and you should choose water purifier according to the test results. But in the general scenario majority of the people uses either municipal water or water from borewell well or river. Also if you found water dirty then you should go for UV + UF water purifier. Municipal water usually does not contain dissolved solids and salts so you don’t need to have RO water purification which will save you a lot of money. River water may contain heavy metals, if wastewater from industrial area is released in the river without any processing. At such scenario you will need RO water purification. In the case you are using borewell or well water then generally it is high TDS water so RO water purifier is the only solution for the purification of high TDS water. Also if you found the water muddy then you should go for a RO+UF water purifier. If it also contains microbial contaminants such as bacteria viruses and protozoa then you should go for a RO and UV water purifier. In case if its muddy as well then you should go for a RO + UV + UF water purifier. 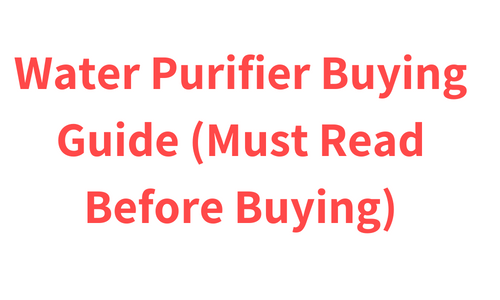 I hope this Ultimate Water Purifier Buying Guide helped you finding an ideal water purifier for you. Let me know if you have any doubts or questions in the comments section below.